Above: Banksy, a British graffiti artist, worked in Brighton where he painted the famous Kissing Coppers on the wall of Brighton’s Albert Pub. Pic from the Independent story, link below. British graffiti artist Banksy’s “Kissing Coppers” sold for $575,000 (£354,000) in an auction on Tuesday 18 February 2014, in Miami. The black and white stencil of two policemen kissing was bought by an unknown telephone bidder, and is is the “latest big auction success for street art”, according to a report by Jess Denham in the Independent Newspaper. One of Banksy’s most famous works, the 2005 mural first appeared on a side wall of the Prince Albert Pub in Brighton. As a resident of Brighton, I had assumed the stencil that remains on the pub wall was the original. So I wonder it it will now be removed? Or maybe all that has been sold is copyright? 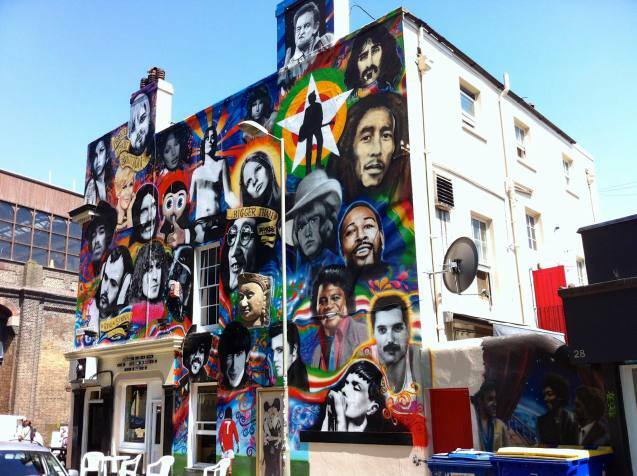 The Icons Mural on Prince Albert pub wall – by Req and Sinna One. Photo by Paul Brown. Copyright on this image belongs to Paul Brown. Fifty-four pieces were auctioned alongside “Kissing Coppers”, including two more Banksy paintings – “Bandaged Heart Balloon” and “Crazy Horse Car Door”. Both artworks were created during the elusive artist’s New York ‘street residency’ in 2013, but failed to reach their respective asking prices of $200,000 and $100,000. “Kissing Coppers” had been expected to fetch up to $700,000, but its winning bid still fell within the estimated price bracket of $500,000. Banksy, whose real name still remains unknown, gained international fame after members of the public noticed his work in Bristol in the early 1990s. Often satirical and political, his graffiti has since popped up around the globe, including in places as far-flung as Bethlehem and New Orleans. Many critics have spoken out in defence of keeping Banksy’s graffiti in its original locations, as the artist’s intention was for his work to be accessible for all. This entry was posted on February 20, 2014 by braveadmin in News Views, Street Art and tagged albert pub, banksy, brighton, Icons, street art.